Optimizing Decision Tree Attack on CAS Scheme, PERKOVIC, T., BUGARIC, M., CAGALJ, M.
Implementation of High Speed Tangent Sigmoid Transfer Function Approximations for Artificial Neural Network Applications on FPGA, KOYUNCU, I. A Programmable Biopotential Aquisition Front-end with a Resistance-free Current-balancing Instrumentation Amplifier, FARAGO, P., GROZA, R., HINTEA, S., SOSER, P.
Analysis of Steady-State Error in Torque Current Component Control of PMSM Drive, BRANDSTETTER, P., NEBORAK, I., KUCHAR, M.
PETREUS, D. , MOGA, D. , GALATUS, R. , MUNTEANU, R. A. Faced with numerous challenges raised by the requirements of the modern industries for higher power and higher energy, supercapacitors study started playing an important role in offering viable solutions for some of these requirements. This paper presents the surface redox reactions based modeling in order to study the origin of high capacity of EDLC (electrical double-layer capacitor) for better understanding the working principles of supercapacitors. Some application-dependent sizing methods are also presented since proper sizing can increase the efficiency and the life cycle of the supercapacitor based systems. Belhachemi F., Rael S., Davat B. "A physical based model of power electric double-layer supercapacitors", IEEE-IAS'00, 2000, Roma. Conway B. E., "Electrochemical Supercapacitors: Scientific Fundamentals and Technological Applications", Kluwer Academic/Plenum, New York, 1999. D'Arco, Salvatore (2006) L'elettronica di potenza per la gestione di sistemi di generazione distibuita", Tesi di Dottorato, Universita degli Studi di Napoli Federico II. Halber D., "Researchers fired up over new battery", MIT Newsletter, 8th February, 2006. IEC 62391-1. 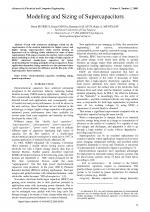 "Fixed electric double layer capacitors for use in electronic equipment - Part 1: Generic Specification", Ed. 1. 2006. IEC 62391-2. "Fixed electric double layer capacitors for use in electronic equipment - Part 2: Sectional specification - Electric double layer capacitors for power application", Ed. 1. 2006. Yoshida A., Imoto K., Yoneda H., Nishino A., "An electric double-layer capacitor with high capacitance and low resistance", IEEE Transactions on components, hybrids, and manufacturing technology, 1992,15(1), pp. 133-138. Zubieta L. Bonert R., Dawson F., "Considerations in the design of energy storage systems using double-layer capacitors Researchers fired up over new battery", IPEC, Tokyo 2000; pp. 1551. 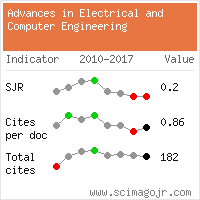 Citations for references updated on 2019-04-22 16:48 in 35 seconds. Website conception, design and maintenance by Eugen COCA. Content updated on 28 Feb 2019. Site engine updated on 28 Feb 2019. This page was generated on the server in 0.035 seconds and loaded in your browser in > seconds.